There’s a lot of lovely things about Spring. The air is getting warmer, the flowers are opening up, people are emerging from their winter hibernations and actually socialising again. But there is a downside. Allergies. There are a few conditions that can be triggered in springtime. Here’s a quick look at the top three. Hay fever is the most obvious and potentially the most annoying condition to be triggered by this time of year. 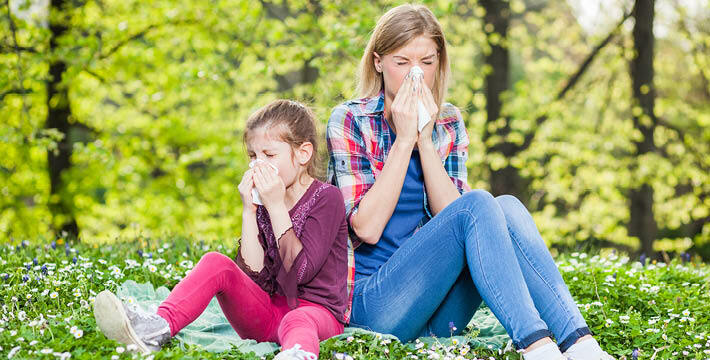 There are more than 10,000 species of grass throwing pollen in the air, and the gentle breeze is bringing it right into the sinuses of hay fever sufferers. Eczema, psoriasis and other skin conditions can have a good flare-up in spring time. With all the pollen in the air, and the changes in temperature – which means more sweating, humidity, air conditioning, etc – the skin can really suffer. Emergency rooms in spring can get an influx of patients having asthma attacks. Why? Once again, it’s that pesky pollen. The pollen can result in airway inflammation and worsen underlying asthma, causing all kinds of problems for sufferers. So with all of these conditions firing up at this time of year, what can sufferers do? Most importantly, get medical advice from a GP to keep everything in check. But along with that, it is well worth trying one excellent natural, drug-free therapy. Sufferers of eczema, psoriasis, hay fever and asthma may experience relief from symptoms with regular salt therapy. At a salt therapy centre, you sit in a comfortable massage chair for 45 minutes and breathe in the pharmaceutical-grade salt pumped through the air. The salt can help improve lung function, clear sinuses, and alleviate skin conditions. Regular salt therapy can assist with better responses to medication, and reduced symptoms from seasonal conditions. If you’re suffering this spring, book yourself into a salt therapy centre today.